Acknowledgement in marriage is something that doesn't happen on its own. I know that I personally don't take enough time to acknowledge my husband in our day-to-day life. It is an area I am working on! I think that everybody desires acknowledgement! Children love when parent's acknowledge their achievements….adults are no different. Being acknowledged makes you feel worthy and special. Today my husband really made my day….by adding in a little acknowledgement in marriage! He took the time to give me some acknowledgement before he headed off to work. It only took a minute, but that minute made my whole day!! So…you are probably wondering what he said that was sooooo great….well let me tell you. Acknowledgement in marriage can be easy! Last night we took our two younger kids to a special Halloween event at a local wildlife park. It was our first year to attend and we had a great time. So this morning as my hubby was getting ready to leave for work he told me that he realized last night how hard I work to make great memories for our family. He said that if it were left up to him, he just wouldn't think about planning vacations or fun outings for our kids. He said he really appreciated the effort I put into making memories for us all. 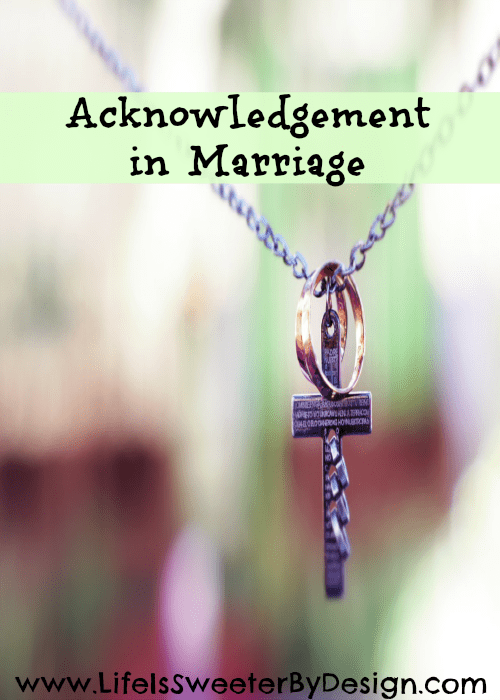 Acknowledgement in marriage only takes a minute! Wow…it was really meaningful to me that he noticed. Yes, we have been married for 17 years. So I think we can all agree that it has taken him a while to notice my hard work in the “making memories” arena, but still…he noticed and even better…he TOLD me! He could have just thought the nice thought and kept it to himself. He may have been thinking how great I am for the past 17 years….but now that he shared that thought with me…it made all my hard work worth it! It got me to thinking that I need to do a better job of acknowledging him and what he does for our family. I know this is a little thing we can both do that will make a big impact on the health of our marriage. Have you acknowledged your spouse lately? Has your spouse acknowledged you lately? How do you acknowledge your spouse? I would love to hear how this works in your marriage! If you are interested in reading a good book for marriage, check out my post on From This Day Forward. You can find it HERE at Family Christian! Thanks for your comments and example Mary! Have a great day!! Isn’t it great when our husbands share their appreciation with us! I love being acknowledged, and I know my man does too. So glad to have you Melanie! I little appreciation goes a long way!! My hubby is always acknowledging the little things I do for him! I am sure that I don’t acknowledge him enough. Thanks for the great read! I am going to make an effort to make sure that I give him thanks and praise for all the big and small things he does for me! Thanks for stopping by Gina! It will be great for your marriage! !